The battle over the state’s bailout of Hartford, and its impact on Connecticut’s credit card, is heating up. While state Treasurer Denise Nappier, a Hartford Democrat, called the deal “a non-issue” when it comes to the state’s debt limit, the other state official who OK’d the deal — Gov. Dannel P. Malloy — disagrees, and wants lawmakers to fix the matter now. Meanwhile, Republican state legislators continue to press to reduce other state aid to Hartford after 2019 to offset the debt assistance. And if Connecticut does have to scale back borrowing to abide by its debt limit, House Minority Leader Themis Klarides says, then projects for Hartford should be the first to go. Under the agreement, Connecticut would pay off the city’s $534 million in outstanding bonded debt and an undetermined about of interest. The state is expected to retire this debt over 20 to 30 years, depending on how Hartford officials renegotiate their obligations with bondholders. Interest charges will depend on those negotiations. Klarides and many other legislators assert the agreement went beyond the level of aid lawmakers approved in the new state budget enacted last October. “In essence, the contract assistance agreement is a non-issue in terms of the state’s debt limit,” Nappier wrote in a statement Friday. 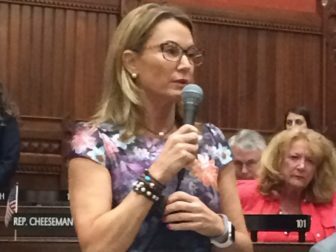 The treasurer, who has been criticized since she signed the bailout deal, took issue with Klarides’ assertion that it could put pressure on the legislature to raise taxes — something the minority leader and most legislators from both parties oppose. “I suggest that colleagues in the executive and legislative branches should first consult with the treasurer’s office as the state’s public finance arm before (making) any public assertions on complex issues such as the debt limit,” Nappier said. The Hartford deal, according to fiscal analysts for the governor and the legislature, will push Connecticut beyond the 90 percent threshold by about $522 million effective July 1. Issue bonds on Wall Street to implement already authorized borrowing. But while this is allowable under law, it would be a break from past practices. The legislature traditionally has responded immediately to projections exceeding the 90 percent threshold by scaling back borrowing, not adding to it — in part because the volatile nature of state taxes can loosen or tighten the debt limit quickly. The General Assembly canceled or delayed close to $1 billion in planned borrowing in 2016 to address debt limit concerns. Governors, who chair the bond commission, traditionally have suspended commission meetings after the 90 percent threshold has been broken. In most cases, the bond commission also must approve borrowing before the treasurer can issue bonds on Wall Street. Does Nappier believe it is appropriate for lawmakers to authorize more bonding, or for the bond commission to approve more borrowing, given the debt limit projections? But the governor takes a different view of the problem. 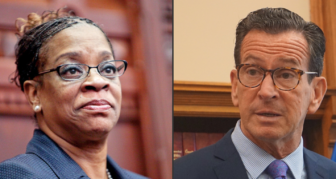 Malloy wrote to legislative leaders on April 20 to remind them Connecticut is on pace to crack the 90 percent threshold on July 1 — unless they exempt the Hartford assistance from the debt limit statute or they are prepared to cancel borrowing. “To be very clear, I continue to support a bond limit,” the governor added. And Malloy doesn’t even intend to wait until July 1 to start trimming planned borrowing, if legislators don’t want to exempt the Hartford bailout from the debt limit. Chris McClure, spokesman for Malloy’s budget office, said Monday that “the governor intends to recommend de-authorizations in time for action this (legislative) session,” which ends on May 9. That probably would involve suspending future bond commission meetings.